Simon Marks Jewish Primary School hires out the school hall and dining room for functions such as parties, meetings and Bnei Mitzva. The hall is a large space with an electronic white screen and projector along with speakers for audiovisual displays. 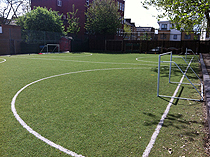 If you are interested in hiring our facilities, please arrange a visit to the school by contacting us. For costs and further details, please contact the school business manager.